We are the leading installer of the revolutionary Induction Loop. 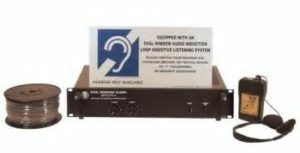 Not since the creation of the hearing aid itself has a new technology come along that can help the hearing impaired in so many ways. All of our installers follow full IEC certification using iec certified Field strength Meters to measure for optimum signal strength for proper installations. We are experienced in both perimeter and phased loop installs. There are a multitude of places that use the Induction Loop System. As seen in the illustration above an office has a loop set up in there conference room. Their loop wire is hidden in the drop ceiling which is then connected to the audio system in order that anyone with difficulty hearing can now hear the audio presentation being made by the projector. Just some of it's uses are Houses of Worship, Schools Universities, Nursing Homes, Vehicles, Courthouses, TV rooms, and Businesses of all kinds. There are Induction Loops for all size rooms and applications. We carry the finest IEC certified products. And because of the volume of business we are able to keep our prices affordable. We carry a variety of Induction Loop products. The same products currently used in our country's Capitol Building as well as the United States Supreme Court. Yet the cost for an Induction Loop System for lets say a 500 square foot House of Worship is less then the price of installing the old fashioned FM system. Which is far less affective and only works with a headset, The induction loop system works with a persons hearing aid or cochlear implant. And if you have a hearing problem and still don't use a hearing aid we have comfortable headsets and/or ear buds that allow perfect hearing. We would be happy to give you a free demonstration of how the system works. Induction loop systems work with hearing aids and cochlear implants. An induction loop wire is permanently installed (typically under a carpet or in the ceiling) and connects to a microphone used by a speaker. The person talking into the microphone generates a current in the wire, which creates an electromagnetic field in the room. Which enables the sound to be carried to the persons hearing aid or implant. On one of my first Loop installations I was installing an Induction loop into the meeting room of a Retierment Home. We were told that many of the residents were having real trouble hearing what was being said in the meetings and they could not hear the Movies on movie night or the music when it was played through their stereo system.When I was doing the installation an elderly man came up to me asking what I was doing. I told him he seemed as though he didn't quite understand but he was very friendly and wished me luck and then he walked away. The woman in charge of activities saw me talking to the man and she told me that his name was Dan and that he was the biggest fan of Movie night he would come for every movie and he would often suggest movies and would be the biggest talker when they would discuss the movies. He would suggest new movies to widen their appreciation of movies. I n any event she told me his hearing was going and that they had to turn the sound so loud in order for him to hear, that others found it too loud. So slowly but surely he stopped coming around on movie night. I thought how sad but all the time thinking about how this new loop would help him. But I wasn't sure if he would come back because of how hurt he was. Well we finished the job the system sounded great one thing led to another and we were on our way. Two weeks later I got a call from the Activities director who told me that on the second movie night Dan showed up apparently he had heard that people were talking about this new system and how they could hear better then ever. well she said he sat down and not seconds after the movie started a giant smile came across his face she said he touched his ear and mouthed to here " I can Hear!" How great is that! !